Posted On May 11, 2017 by &filed under Legal Articles. Injunction is an equitable relief and it is a settled law that equity acts in personam, therefore, injunction is a personal matter. 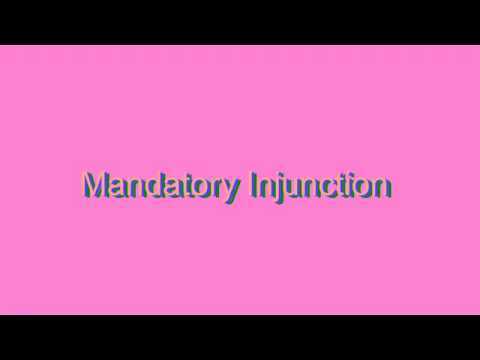 The purpose of mandatory injunction is to restore a wrongful state of things to their former rightful order. Principal difference between prohibitory injunction and mandatory injunction is that, in the former the defendant is prohibited from doing a particular thing in a particular manner, whereas, in the latter, the defendant is directed to do a particular thing and if he fails to do as directed, the court gets it done through its officers. Section 39 of the Specific Relief Act, 1963 does not define but categorically deals with grant of mandatory injunction. Two elements have to be taken into consideration to determine the grant of mandatory injunction, these are: (a) What acts are necessary in order to prevent a breach of the obligation; and, (b) The requisite acts must be such as the court is capable of enforcing. Mandatory injunction is not to be granted: (a) Where compensation in terms of money would be an adequate relief to the plaintiff; (b) Where balance of convenience is in favour of the defendant; (c) Where plaintiff has shown acquiescence in the acts of the defendant; and, (d) To create a new state of things, but rather to restore status quo. In the case of, Dorab Cawasji Warden v. Coomi Sarab Warden, the Hon’ble Supreme Court of India held that, for grant of interim mandatory injunction the following test must be complied with: (a) The plaintiff has to demonstrate a strong case for trial, that is, it should be of a standard higher than that of a prima facie case; (b) The plaintiff has to lay-bare that the grant of mandatory injunction is necessary to prevent irreparable loss or serious injury, which cannot be compensated in terms of money; and, (c) The balance of convenience is in favour of the plaintiff as against the defendant. Mandatory injunctions are sometimes availed of as reliefs in the nature of ‘quia timet’, that is, in a proper case, mandatory injunction may be granted when there is a threat of infraction of the plaintiff’s right before the infraction has actually occurred. Section 5 of the Specific Relief Act, 1963 deals with an action apropos the recovery of possession of an immovable property based on title; the essence of this section is that whoever proves a ‘better title’ is the person ‘entitled to possession’. Section 6 of the Specific Relief Act, 1963 restrains a person from using force to dispossess, or, to dispossess a person without his consent otherwise than in due course of law. Under Section 5 of the Specific Relief Act, 1963 a person dispossessed can get possession on the basis of title, whereas, under Section 6 of the Specific Relief Act, 1963 a person dispossessed may recover possession merely by proving previous possession and subsequent wrongful dispossession. A legal recourse undertaken by a licensor to dispossess the licensee, broadly, falls under Section 5 of the Specific Relief Act, 1963. If an interest in the property is created by virtue of a deed, it is a lease, but, if the document only permits another person to make use of the property of which the legal possession continues with the owner, it is a license. Suit for mandatory injunction can be filed by the plaintiff-licensor to oust the defendant-licensee after the expiry of the term of license. In the case of, Sant Lal Jain v. Avtar Singh, it was held that, where a licensor approaches the court for an injunction within a reasonable time after the license has terminated, then, the court shall be obliged to grant him injunction, however, if the licensor causes huge delay, then, the court may refuse to exercise its discretion apropos the grant of injunction on the ground that, the licensor has not been diligent and thus, in that case the licensor will have to institute a suit for possession which in fact will be governed by Section 7(v) of the Court Fees Act, 1870. In the case of, Milkha Singh v. Diana, it was observed that the principle- ‘once a licensee always a licensee’, applies to all kinds of licenses, and it cannot be said that the moment the license is terminated, the possession of the licensee becomes that of a trespasser, that is, a suit for mandatory injunction and not a suit for possession, will lie to oust the erstwhile licensee. When a suit for mandatory injunction is instituted by the licensor against the licensee to oust him of the suit property after the termination of the license, then, it shall not lie in the mouth of the licensee to state that, a suit for mandatory injunction is not maintainable because the title of the property is in a cloud of doubt and what the licensor should have preferred is a suit for possession and not mandatory injunction. Section 116 of the Evidence Act, 1872 categorically states that, a licensee obtaining possession is deemed to obtain it upon the terms that he will not dispute the title of the licensor who gave the possession to him and without whose permission he would not have got the possession. Two conditions are essential to enforce the estoppel contained in Section 116 of the Evidence Act, 1872, these are: (a) Possession of the property must have been given to the licensee/tenant, and, (b) Such possession must have been taken with the permission of the licensor/landlord. Once these two conditions are fulfilled, the licensee/tenant becomes subject to estoppel, and continues to remain subject to it so long as he remains in possession of the property. In the case of, Joseph Severance & Ors v. Benny Mathews & Ors, it was held that, licensee may be the actual occupant of the property but the licensor is the person having control and possession over the property through the licensee even after the termination of the license. There can be varied situations such as those whereby the licensee may require to keep the possession of the property with himself for some time post the termination of the license so that he can wind up his business; in such situations, the possession of the property that the licensee keeps with himself so that he can wind up his business from the suit premises cannot be termed as an act of trespass. But, on the other hand, there can be situations whereby despite the termination of the license, the licensee retains the possession of the property with himself and the licensor neither objects to it, nor takes necessary steps to cause the eviction of the licensee with promptitude; in such situations, the erstwhile licensee will be treated as a trespasser and the licensor will have to come up with a suit for recovery of possession and not mandatory injunction. Therefore, the position that entails in law can be summed up by saying that, the possession of licensee does not become hostile the moment the license comes to an end; none the less, the licensor is required to file a suit for mandatory injunction to oust the licensee with promptitude categorically praying that, the licensee should be directed by the court to vacate the suit property without delay. If X, son of Y, starts living in the house of his father, that is, in the house of Y with the permission of Y, and then later when Y requests X to vacate the possession, it shall not lie in the mouth of X to claim ownership in the property by reason of the fact that, X is the son of Y and has been residing in the house of Y in the capacity of the son of Y. It shall be open to Y to bring an action by way of suit for mandatory injunction against X to cause his vacation from the subject property and at best the possession that X enjoyed will be termed that of ‘permissive occupier’ or ‘gratuitous licensee’. Where the defendant-licensee contests the suit for mandatory injunction filed by the plaintiff-licensor taking prima facie objection that, only a suit for recovery of possession can sustain and not mandatory injunction on the ground that, the possession that defendant-licensee enjoyed was neither hostile, nor intolerant, further, despite the lapse of license no swift action was taken to cause the eviction of the licensee; then, taking into account the facts and circumstances of the case and to do complete justice between the parties to the case, the court can direct the conversion of the suit for mandatory injunction into a suit for recovery of possession to avoid multiplicity of proceedings and to save the plaintiff-licensor from incurring extra cost, trouble and disbursement, subject to payment of the extra attendant court-fee as is leviable apropos a suit for recovery of possession according to the value of the property forming the subject-matter of the suit for recovery of possession. Merely because the plaint is couched in terms of ‘suit for mandatory injunction’ and not ‘suit for recovery of possession’, the necessary relief cannot be denied to the plaintiff-licensor. According to Order VII, Rule 1(i) of the Code of Civil Procedure, 1908, the plaint must contain a statement of the value of the subject-matter of the suit for the purposes of jurisdiction and court-fees, so far as the case admits. In the case of, Ram Narain Prasad v. Atul Chander Mitra, it was held that, valuation for the purposes of court-fees must be made on the basis of the averments contained in the plaint and the relief sought thereof, and the averments contained in the written statement are not material in this regard. In the case of, Padmavati Mahajan v. Yogender Mahajan & Anr, it was held that, a suit for permanent mandatory injunction can be valued by the plaintiff exercising his or her discretion, subject to the caveat that the said discretion is neither whimsical, nor fanciful; a suit for permanent mandatory injunction is not required to be valued at the market value of the property. (a) Law apropos injunctions is vast and expansive, and is essentially based on the principles of equity, justice and good conscience, namely, the following: (i) One who seeks equity must come to the court with clean hands; (ii) One who seeks equity must do equity; (iii) Where there is right there is remedy; (iv) Where equities are equal, the law will prevail; (v) Equity follows the law; (vi) Equity aids the vigilant, not those who slumber on their rights. (e) Licensor-plaintiff is at liberty to value his suit for mandatory injunction based on his discretion so far as the exercise of discretion is not whimsical or fanciful. Suit for mandatory injunction is not to be valued based on the market value of the suit property.